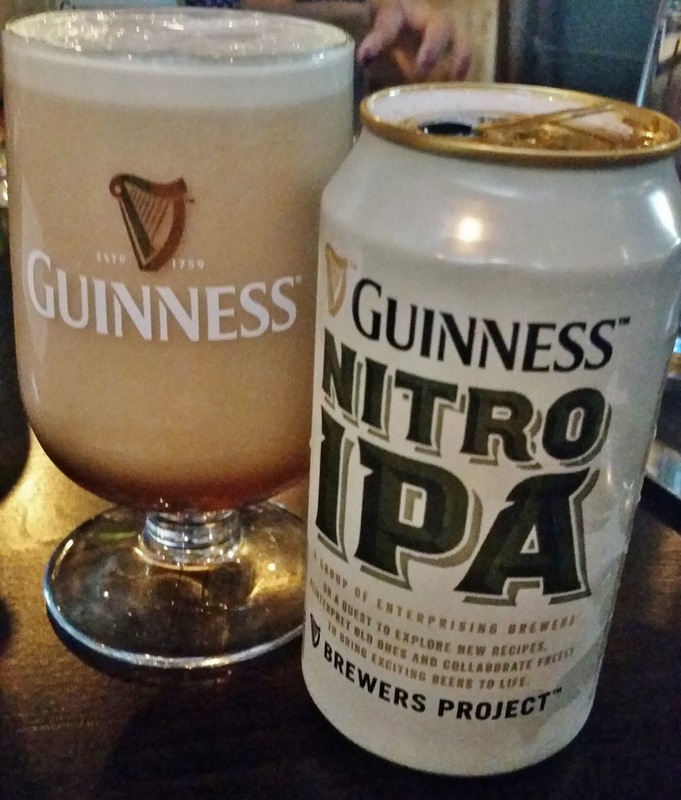 Guinness is rolling out a new product in the U.S., Nitro IPA, in nitrogenated cans and on tap at select bars. The beer is a part of Guinness' The Brewers Project in which six brewers are exploring new beers at a pilot brewery at Dublin's St. James's Gate. At a preview dinner last night two Guinness employees talked about the beer, noting that the company values balance in their beers. While the beer is brewed with five hop varieties - Admiral to start, Topaz and Celia in the whirlpool, followed by Challenger, Cascade and more Topaz for dry-hopping - they were clear that this is an Irish IPA, not an American IPA. This is a particularly important distinction for hop heads like myself that are used to a strong hop punch from their IPAs. 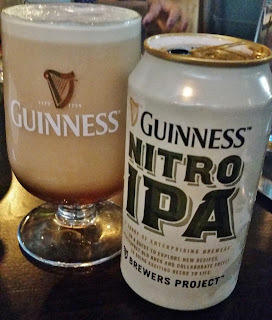 The combination of being an Irish IPA, being served on nitro - which tends to mellow the hop bite of any beer - and being brewed with the same proprietary, 100+ year old yeast strain used in Guinness stouts makes for a beer that one might be more pleased with were it called a Pale Ale instead. It's a simple fact that there are expectations based on style and when a beer doesn't meet that expectation the overall impression may be less than stellar no matter how well made the beer is. When asked about who the brewers hoped to reach with this beer, they said it wasn't developed with a particular segment of drinkers in mind. I'm certain they're hoping to tap into both the pool of IPA fans they hadn't reached in the past as well as those who are classic Guinness stout fans. Whether each pool will be hooked will be interesting to see as it likely won't be hoppy enough for most IPA fans and perhaps too hoppy for stout fans. Either way, one cannot dispute the visual appeal and silky mouthfeel the nitrogen widget, developed by Guinness in 1988, produces. And at the suggested retail price of $8.99 for a six pack of 11.2oz cans, it is an approachable price point. 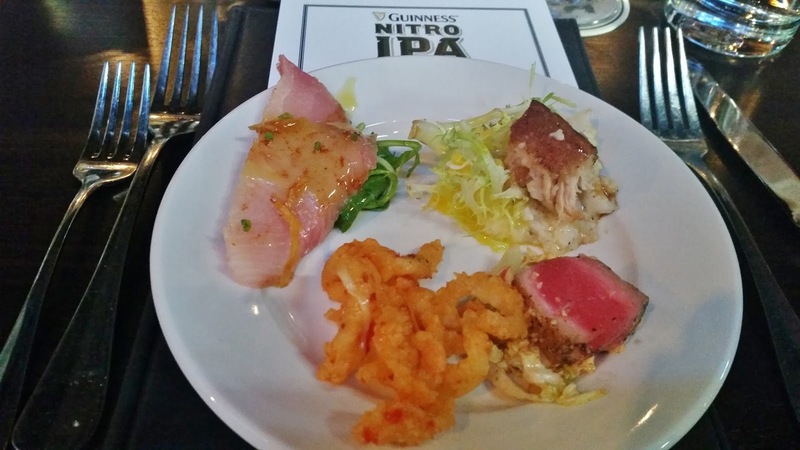 Seeing that it was a "dinner" you might be wondering how the beer pairs with food. 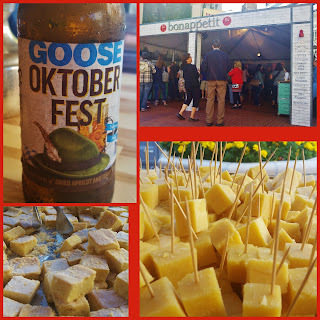 My overall impression was that it is a good "with food" beer. By that I mean that while the beer didn't pop or make any of the dishes pop, it also didn't distract from, clash with or overpower any of the dishes either. 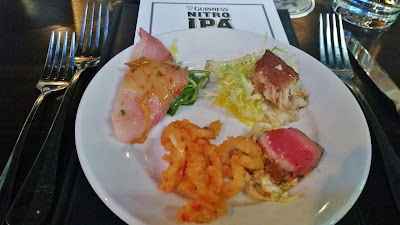 Even the dessert, Guinness Pot Au Creme, which I hoped would be served with stout, remained delicious with the IPA. A sessionable - 5.8% ABV - beer, it is one that could easily consume a few pints of during the course of dinner, or an evening. Hello, friends. 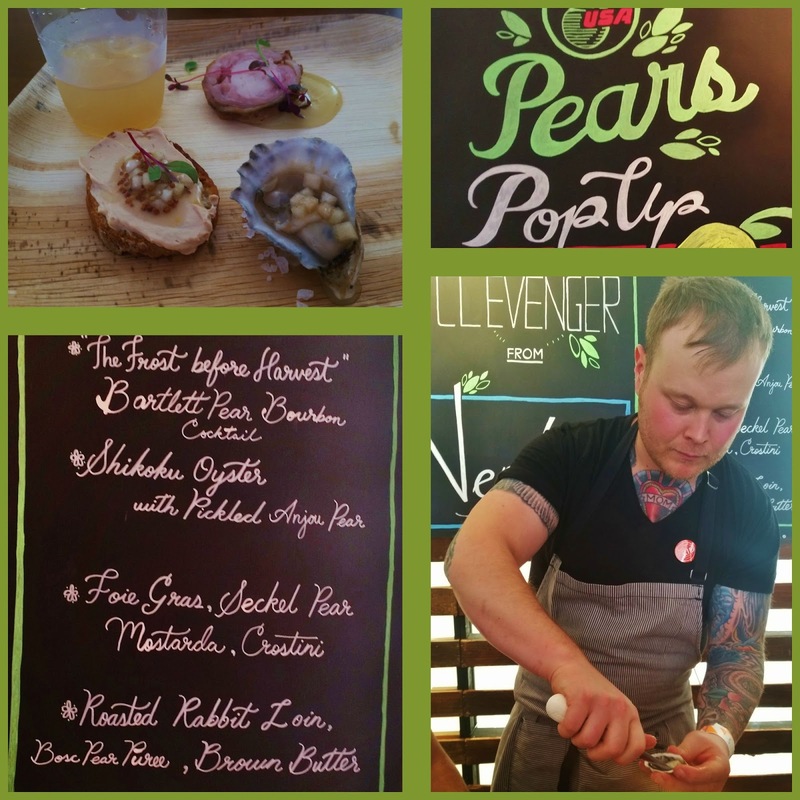 I've finally pulled out of my Feast Portland-induced food coma and I'm back to share a few things that Feast not only opened my eyes to, but can still be had even though the Feast party is officially over. Coffee and pastries are a no-brainer combination and while a beer might not be on the docket for weekdays, this would be a hell of a way to start weekend day. 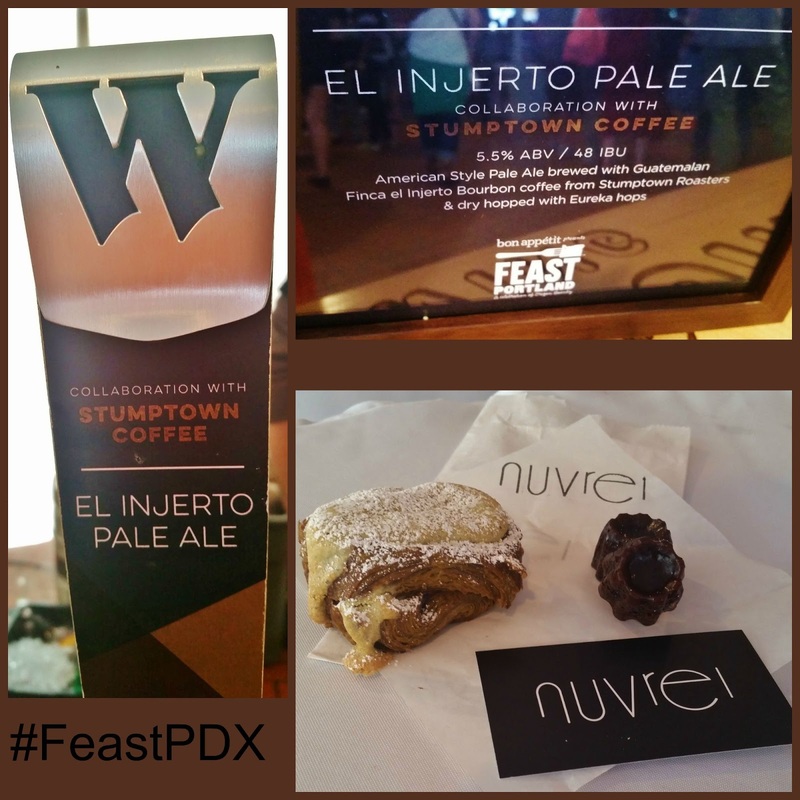 Located in the North Park Blocks area, Nuvrei offers savory and sweet pastries, any of which, if this particular croissant isn't up your alley or isn't available when you go, would likely be lovely with this coffee beer. 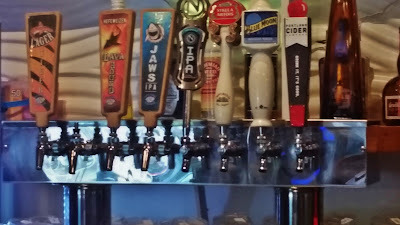 Your best bet to get the beer is to visit Widmer's pub and get a growler of it. I was a Pip's virgin before Feast Portland and unaware of the amazingness of their doughnuts. They're like the hot, fresh ones from childhood fairs, the way I remember them tasting (although those doughnuts would undoubtedly not taste as good as my memory). They need no more than a drizzle of honey and a dash of sea salt to shine. And like the last pairing, albeit a non-alcoholic version, coffee and sweets are a no-brainer. 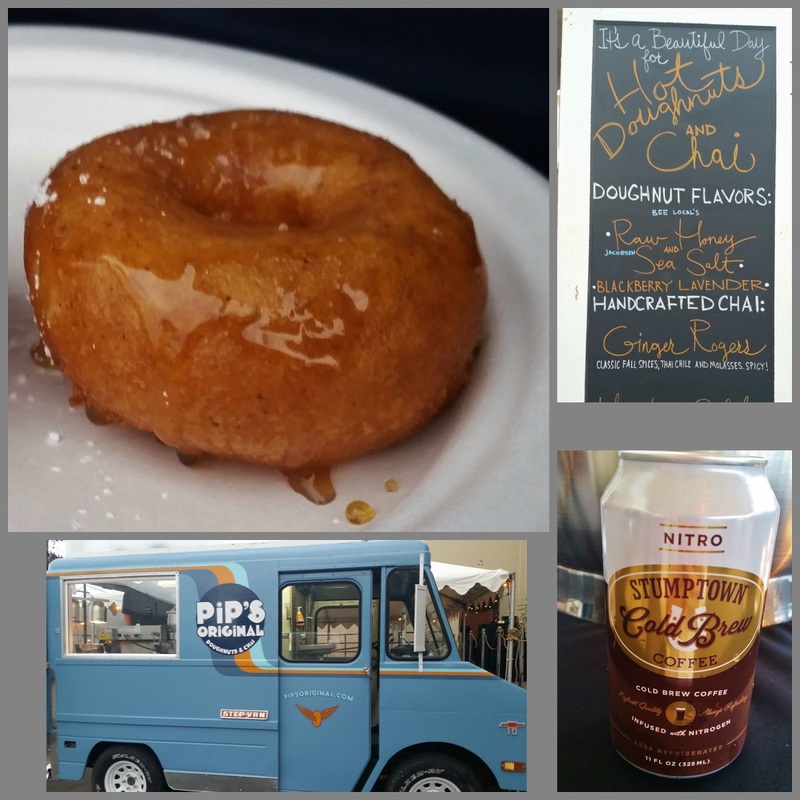 Cold-brew fans should grab a can of Stumptown's Nitro, an incredibly smooth cold coffee, and enjoy bites of hot doughnuts alternated with cold, creamy coffee. 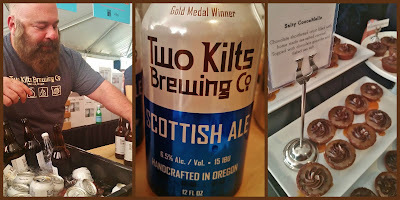 Scottish ales tent to be a bit malty and sweet for me on their own but Two Kilts Scottish Ale is a great compliment to Annie Pies Salty CocoaMello. 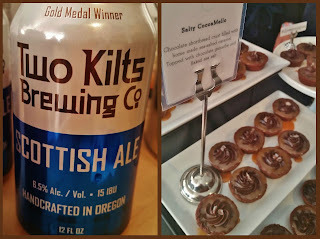 Enjoy this for yourself by visiting your local New Seasons Market to pick up a half dozen (more if you intend to share) of these salty, chocolate bites to go along with the conveniently portable cans of Two Kilts, available at many retailers. 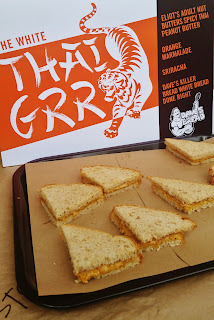 Their entry for Thursday's Sandwich Invitational, it's a deceptively combination that might not have much curb appeal but once it's in your mouth you'll be a believer. 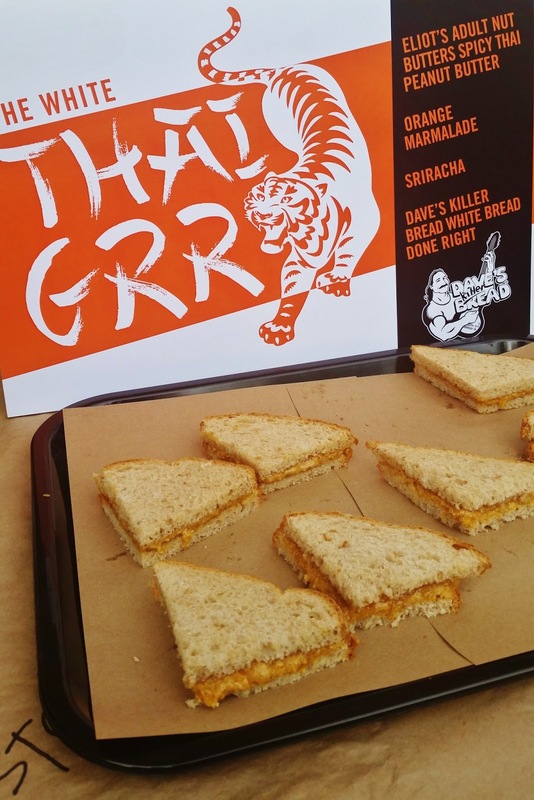 Making your own is simple: grab a loaf of Dave's Killer Bread White Done Right, a jar of Eliot's Adult Nut Butters Spicy Thai Peanut Butter (at most New Seasons and Whole Foods), a jar of orange marmalade and pull that bottle of Sriracha out of the fridge. Eat, enjoy, repeat, adjusting the ratios to your personal preference, until one of the ingredients runs out and you have to make a supply run. An easy snack (or dinner if you're feeling indulgent/lazy) would consist of a baguette, chevre and honey. 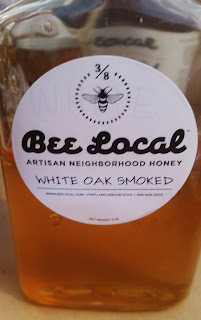 Use this honey however and I dare you not to eat the entire baguette, all of the cheese and at least half of the bottle of honey. In fact I bet it would make a killer nut butter and honey sandwich. For those going to the Oregon Bounty Grand Tasting at Feast Portland today, there are a few things you should definitely do. 1. Go up to the wine tent and get a sling for your wine glass. There are no beer glasses so accept you'll have to drink beer out of a stemmed wine glass and make your like easier by using the sling, thus freeing up a hand. 2. 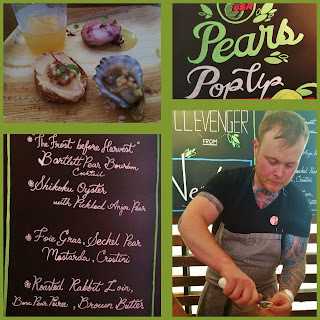 Get a couple bites and sips and then make a beeline for the USA Pears Pop Up. "Seatings" are only every 15 minutes but if you do this early you may only have to wait a few minutes. You'll get a bourbon cocktail that isn't shy on the bourbon and three outstanding bites. My personal favorite was the Foie Gras and Seckel Pear Mostarda on Crostini. 3. Go a row or two over, near the center of the main tent, get a Scottish Ale from Two Kilts Brewing and have it with the Salty CocoaMello from their neighbor, Annie Pies. 4. Go to the far left side to the main tent (of you're outside, looking in), grab a Buoy Beer Co. Cream Ale and the Wasabi Tuna with Buoy Beer Aioli from the Stephanie Inn next to them. Last year my favorite thing was in the same spot as the fish, which was also fish, so I'm starting to feel this is a blessed spot. 5. When you feel like you've gotten the bulk of the main tent covered, or it starts getting too busy, head up to the Bon Appetite area. There are only a handful of vendors up there but make sure to visit Kerrygold. The have generous cubes of cheese and melt-in-your-mouth shortbread that pairs wonderfully with the Goose Island Oktoberfest. 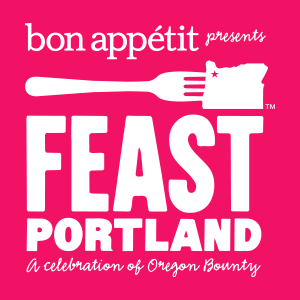 I cannot believe that in just over a week this year's Feast Portland starts. That means is that there are quite a few events that have sold out but don't despair; you've not missed the boat completely. To help you out, my beery friends, I've come up with a list of four events, one for each day of Feast, that still have tickets available and I think will be up your alley. As I mentioned in my last post, I am SO excited to be going to this event! And I can't believe there are still tickets left. Get yours now and join me. Part of the Drink Tank series, it's described as an introduction to some of the world's most sought-after collectible beers. The exciting part about this particular event for me is that locals Sarah Pederson of Saraveza and Lucy Burningham, author of Hop in the Saddle, are part of the five-person tastemakers panel. These awesome ladies know their beer and it should be a good time. Another offering from Drink Tank, this panel includes David Logsdon of Hood River's Logsdon Farm Brewery and Christian DeBenedetti from one of the newest breweries in Oregon, Wolves & People Farmhouse Brewery in Newberg. A guided beer brunch? It sounds like a slam dunk to me. I've never been to a pairing event that I didn't love and coming from the folks at Feast I'm sure it will be a delicious way to brunch. These are not the only events that still have tickets left so if you're looking for more check out the full schedule. But whatever you do, if you've been meaning to make plans to attend Feast, don't wait any longer because it's coming next week. Forgive me, Beer Geeks, for I have sinned. 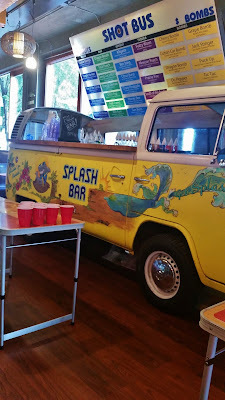 Maybe that's being a little dramatic but earlier this week I did finally cave to the pull of $1 happy hour beers at Splash Bar. As you may have read about over on The New School, Splash Bar offers pints of their house beers - currently three of them - for a mere $1 during happy hour and $3 the rest of the time. So with a little time between their 5pm opening time and dinner plans with friends I stopped in. Going in I had set the bar pretty low in my mind for what the beer would taste like and a first glance at the surroundings, beer pong tables set up for play and a shot bus just inside the entrance, didn't do anything to improve my expectations. Nonetheless I was there and I promptly ordered up the first pint - Tiger pale lager. It shouldn't come as a surprise that it's quite similar to a beer of the same name from Asia Pacific Breweries. For a buck, sure, I'm in. Perhaps even for $3 although I'm pretty sure it would be a weird experience to be at Splash Bar after the end of happy hour when the age of the target market would leave me feeling older than I want to. Since Mag was joining me I ordered up a second pint, Jaws IPA. This is not your typical NW IPA; instead it's a mild version and apparently it's specifically designed to be more approachable for a crowd that probably doesn't get into hops the way you and I do. Again, exchanging one dolla for a pint of it is an acceptable transaction. However between the pale lager and the IPA I have a slight preference for the lager. I'd rather either have the hops be there or simply drink something where they aren't expected to play a prominent role. While we could have finished those two and split the third house offering - Lava Hound Hefeweizen - we decided to shove off to meet our dinner companions. Perhaps I'll stop back sometime when I'm in the area to try that or something else they've brewed up. 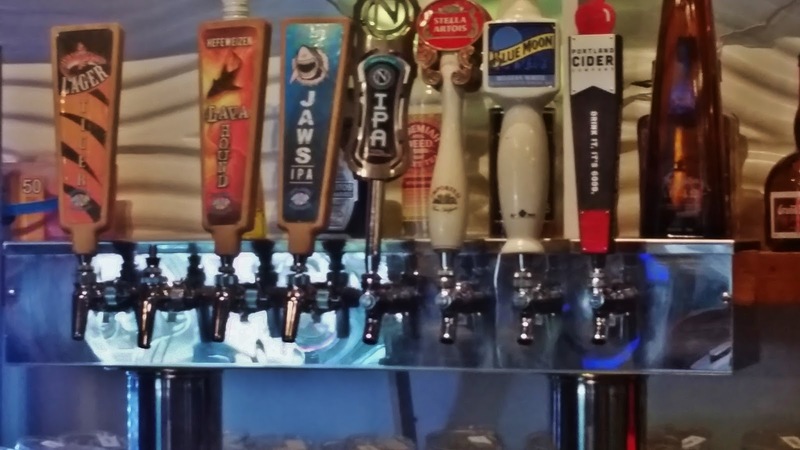 If you're nearby, feeling thirsty but not particularly discriminating give it a try. You've probably spent considerably more to be disappointed by at least one other beer in the past. 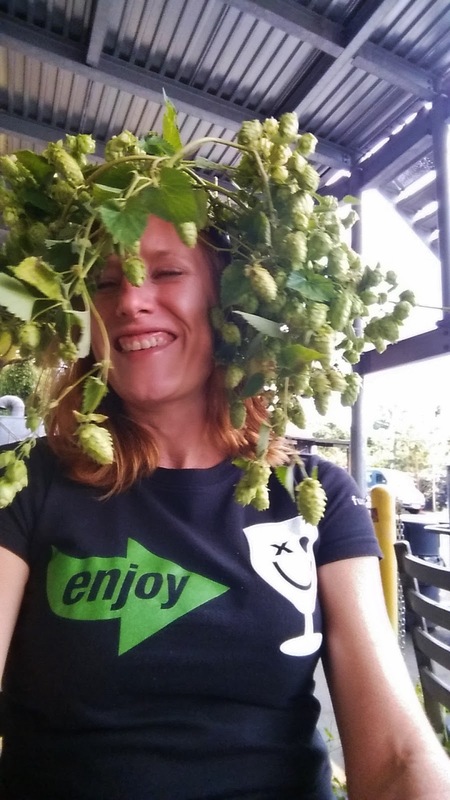 Yesterday's hop harvest at Hopworks Urban Brewery was a very fitting way to usher in September, fall and the best time of year for brewers - the hop harvest. Coincidentally, it was also harvest day for the McMenamins breweries. Called the "Running of the Brewers", it's a marathon of a day starting with the bines coming out of the Sodbuster Farms fields in the morning followed by a mad rush for seven drivers who delivered 1,120 lbs of fresh Simcoe hops to 20 McMenamins brewing locations for this year's Thundercone. Many photos and videos documented the event on their Instagram account. Back to Hopworks, a smaller scale operation, but one that annually invites the public to come help with the harvest of the estate-grown hops from the SE location. Picking hops is a fairly mindless task but what makes it fun is meeting and chatting with the other harvest helpers. This year I was seated next to a couple of gentlemen from Oregon City and as usual when craft beer drinkers get together, we had no problem keeping the conversation going during the four hours of picking. 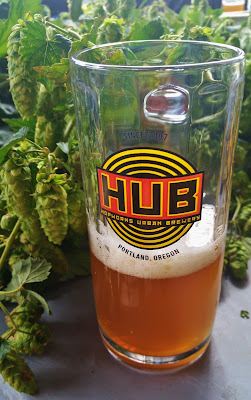 The hops that the group picked were a combination of an experimental variety that currently has the unfancy name of X17 and Willamette and Cascade hops from their backyard. In total 94.9 pounds went into the brew kettle to create Estate IPA, a beer that is the fresh hop version of the classic Hopworks IPA. The fresh hop beer will be available in two to three weeks and when it is I plan to get down there to do a side-by-side tasting of the Estate IPA and its classic cousin. If you, too, want to get your hands dirty (literally - your hands will get dirty and sticky and you'll LIKE it), mark your calendar for next Tuesday. That's when the SE location of the Lucky Lab will be holding their community harvest. 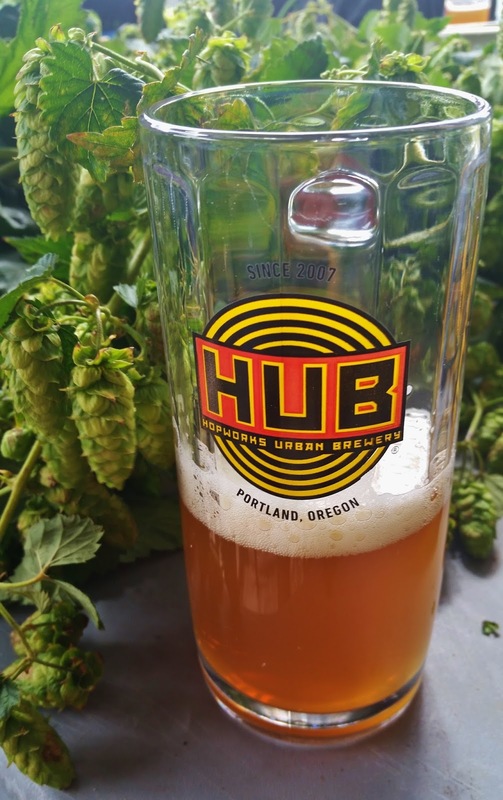 Everyone is invited to help pick the fresh hops off the bines, a combination of ones grown by Lucky Lab, homebrewers and drinkers across the city. The conglomeration of many varieties of hops will be used for the 11th annual brewing of The Mutt.